I closed my eyes and soaked in my surroundings: the sand between my toes, the warmth of the sun on my face, the roar of the waves crashing in front of me. Medical school was thousands of miles away. Nervous excitement was flowing through my veins. Then the count-down began, the horn sounded, and I ran head-on into the 10ft+ waves amidst a sea of a couple hundred swim caps. 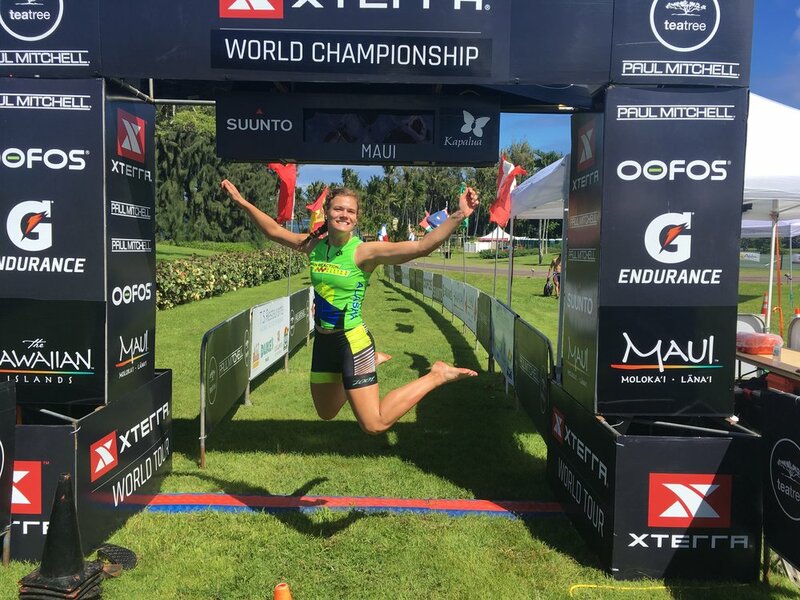 The 2018 Xterra Triathlon World Championship race was underway. In the middle of the semester of my second year of medical school. Well, to begin explaining I have to go back to the “oh so carefree” days before med school. I had been a student-athlete my entire life, from my early years as a gymnast, to junior high volleyball, to high school running and skiing, to D1 Nordic Skiing at the University of Vermont. Therefore, when I decided to go to medical school, I knew that I would need to find a new physical activity outlet. My husband calls me a “social exerciser” because, though I do enjoy the activities of swimming, biking, and running, I love getting to build friendships while being active. I have made some amazing friends, who are my swimming, biking and running buddies. We help keep each other sane throughout medical school. Additionally, my mountain bike’s name is Flo, which is short Fluoxetine; it’s my form of anti-depressant. Nothing throws off the weights of medical school quite like ripping around the dirt trails on that bike! I believe that exercise is beneficial for your mind and body; that’s why I believe everyone should find an activity that they enjoy and do it regularly. Xterra Triathlons involve an open-water swim, a mountain bike, and a trail run; they combine some of my favorite activities into one event. I ended up qualifying for World Championships through a couple Xterra Triathlons that I raced over the summer and in the early fall. However, with my priorities as a medical student, I knew it would have to work with school before I could even consider going. Thankfully, I attended a medical school that encourages its students to invest in their lives outside of school: their families, churches, sports, etc. The PNWU faculty supported me and allowed me to make-up the work needed to be able to race in this event. I’m blessed that PNWU allows me to enjoy my passions outside of school. This race was a life experience that I will never forget. Though I have ski raced in below zero temperatures and through snow storms, I have never experienced conditions quite like those in Maui. The swim was a mile-long M-style swim, which means you swim out-and-back twice with a short beach run in-between. Which meant swimming out-and-back into the 10ft+ waves... twice. Those waves stole many goggles and swim caps, and even broke an arm that morning. The storm that brought the waves also had drenched the trails the night before, making the 20 miles of mountain biking a complete mud-fest. A before-and-after of “Flo,” my mountain bike. We trudged up the muddy hills as a caravan of racers, pushing our bikes when needed, and stopping to clear our tires when necessary. Around the same time I lost track of the number of times that my wheels had stopped spinning completely, the “race” turned into an “adventure” for me. During this muddy adventure, I made some friends from around the world: the Czech Republic, Germany, Boston, and Hawaii. One of my proudest moments was when I cruised head first into a 100-meter swamp, determined to stay on my bike, and instead ended up completely stuck in the middle of the muddy three-foot-deep pool. I had a good laugh with the racer behind me over that one. Needless to say, I was relieved when I made it back to transition with my bike still in one muddy piece. However, the mud-fest continued during the run through the jungle. At about 4.5 miles of the 6-mile course, the trailed opened up to look out over the beautiful ocean, with its enticing clear, cool water. After following a trail straight down to the beach and a couple hundred meters of a delightful, exhausting beach run, the adventure was complete! My 4 hour, 39-minute adventure was challenging, both physically and mentally, but the reward of finishing despite the conditions was, well, rewarding! After a quick dip of the toes in the ocean, clean-up, pack-up and dinner, I found myself back on an airplane studying the gastrointestinal system, the lei from the finish line draped around my neck serving as a fun token to remind me of my adventure. Although it was short, the trip was refreshing and reminded me of the type of physician that I want to be. I want to be a physician that encourages and leads their patients by living a healthy life myself. I know that life as a D.O. will always be busy, so I want to start ingraining good life habits now, as a student. Though I may never have as much time to train as I once did, I am happy to still be able to exercise and race. Only now it is for 100% fun and enjoyment. It keeps my mind, body, and heart happy!